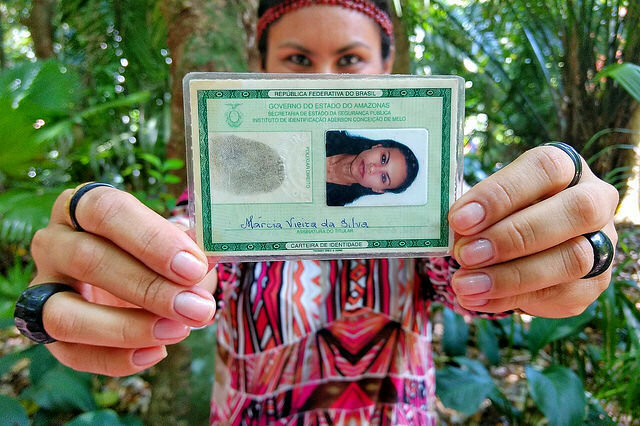 Nearly 2,000 indigenous from Brazil have filed requests to have their indigenous names appear on birth records and government identification cards, according to public attorney’s from the Strategic Action for Human Rights. Indigenous peoples from the Brazilian state of Pará were forced to reach out to public defenders after their name change requests were denied by local officials on the grounds that it was for their own protection to deter against any potential "prejudicial treatment." "I have always identified with my indigenous name but my government documents have always included my non-indigenous name, which makes me feel as if my identity was not being acknowledged," said Pytàwà Fabiano Warhyti Soares, who is in currently in the process of having his name changed. Pytàwà is among many Brazil’s indigenous peoples whom are forced to navigate the challenges of embracing their ethnic identity due to government and institutional barriers. Márcia Kambeba, whose indigenous name is Wyana Kiana, emphasized the importance of being able to maintain her indigenous identity by exercising her legal right to use her ancestral name. "The importance of having an indigenous name is that it strengthens the people, it keeps our ancestral memories and resistance alive. It represents a continuation of the struggle, the knowledge and the existence of our people," Said Wyana Kiana, who has also requested a formal name change. There are about 240 tribes living in Brazil today, totaling around 900,000 people, or 0.4% of Brazil’s population. “When we began our legal work in the area Indigenous identity rights, we also saw it as a tool that could help maintain and guarantee their legal claims to their ancestral territory,” Public defender Johny Giffoni the with NDDH stated. All of this takes place as Indigenous territory and culture across Brazil has come under threat due to recent constitutional changes approved by Brazilian President Michel Temer.